Double LP set. From Back On Black Rock Classics comes the release of the original classic Thin Lizzy albums on 180-gram vinyl, remastered from the original master tapes. 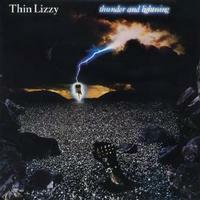 Thin Lizzy's final studio release, 1983's Thunder and Lightning, was their most consistent album since 1979's Black Rose. Guitarist John Sykes replaced Snowy White, and the new blood must have inspired Lynott and company to write some of their best compositions in years. While the title track served as the ensuing tour's raging opener, half-baked lyrics detailing a fistfight and an unwarranted synth-solo weakens what should have been a straight-ahead rocker. But such heavies as "This Is the One" and "Cold Sweat" suit the band much better. Lizzy takes a stab at dance-rock with "The Holy War," while laying back with the tranquil "The Sun Goes Down" and the album's underrated highlight, the melodic "Bad Habits."